Provided below is a description of common controls used throughout the QLR Manager panels. The controls a user may see will depend on the authorities granted to the User ID by the Administrator. All the QLR Manager panels have a Header for page navigation. The header tabs displayed after logging on from the Connect panel will depend on the product function selected and the level of authority granted the User ID. In many cases, the header tabs can be used instead of form buttons within the body of the panel, with some limitations. For example, if a query exists in the Query panel, the Report tab can be used to execute the query as an alternative to the Run Query button in the panel. However, if the Report tab is clicked from the Menu panel, QLR Manager does not know which query or macro to execute and will instead display the message - You must run a menu item to view the output. Many such color coded messages exist to help guide the User. GREEN messages are for information, AMBER indicates a user action is being performed, and RED is an error condition describing why QLR Manager cannot continue. The following are some common elements and functions of the Header, regardless of the product function selected. Manager can be clicked to launch the full User's Guide. Contextual help is also provided throughout QLR Manager and is associated with bold text and field labels. The mouse cursor will change to identifying links to help text. After connecting, the User ID, Database and Server are displayed above the header tabs. The Log off button can be used any time to disconnect the User ID, delete any output temporarily stored on the server, and terminate the session. The "Report tools" icon may be substituted with "Output tools" or "Preview tools" depending on the type of output being viewed. Clicking this icon will launch a small popup window that provides options for finding text in the output, printing, e-mailing, and downloading many useful formats of the output. After output has been generated and the User navigates to another panel, this icon will change to "Current report", "Current output" or "Current preview". This provides any easy means of returning to the previously generated output without having to rerun. For MySQL, the database is the specific set of tables within the overall database system to which the User is connecting. The User must have the authority granted by the Database Administrator to connect to a particular database. If an SQL command is issued to create a new database, the User must access the Connect panel to reconnect and then return to the Query panel to see an updated list. For Oracle and PostgreSQL, the "Select Database" control lists the schemas where the currently connected User ID has access to at least one table within the listed schema. Selecting a different schema name will update the list of tables that can be selected to view the column attributes. This does not change the currently connected User ID, which can only be changed from the Connect panel. The "Table info" selection list allows the User to view the columns, and their attributes, of the selected table. A separate browser window will be opened to display the column information. The list of tables available to choose from is based on the currently selected database/schema. If an SQL command is issued to create or delete a table, the User must select the database/schema again to refresh the table list. To view the list of items that others have shared, their Owner (User ID) can be selected from the Existing (objects) control near the top of each panel. This will update the list of available Name objects that can be selected. • The Name objects can be sorted using the icons adjacent to the select list. • The currently displayed object name can be retrieved by clicking the Get (object) button. • The currently displayed object name can be deleted by clicking the Delete button. Objects owned by the logged on User ID are the only ones the ID has authority to delete. The Owner is the User ID under which the object was saved. It is the ID under which the database connection was established. The Name of the object as provided by the Owner when the object was last saved. Objects can be organized by saving them into folders. When retrieving an existing object, the objects will be listed under the saved folder name in an "option group". When objects are sorted in ascending sequence, the objects saved in folders will appear at the end of the list. Conversely, a sort in descending sequence will list the option groups at the top of the list. When the objects in the list are sorted by descending save date, the option groups are omitted. After an object has been retrieved for use, the current object name is displayed near the top of the panel for reference. The name will be prefaced with "Current Query", "Current Layout", "Current Macro", or "Current Menu", depending on the panel being viewed. If a description was provided for the object when it was saved, an i-nfo icon will follow the object name. Mousing over this icon will display additional information about the object. • Font and background colors for cells in reports. • Font colors for titles and labels. • Border and background colors for tables and charts. • Plot color ranges for charts. For each of the above applications, the color selector will look slightly different, but the general layout and function of the controls is the same. Note: Click the labels 1 - 6 or the link in the description for more information about the function. 1 Display of the current color(s) and any modifications. 2 Display of the custom colors provided as defaults or previously modified by the User. 3 HSV color selection using a pointing device. 4 Controls to create colors or enter known hex values for specific colors. 5 Selection of color to change when both font and background colors are required. 6 Control buttons to modify custom colors and apply changes. * The color selector to apply plot colors for charts is described separately below. When the color selector is launched, the current color(s) are displayed along with an area to display any modifications made. The color(s) in the NEW area are those that will be applied when the Apply button is pressed. The text "NEW" is only displayed for color selections that include a foreground color. A default set of coordinated colors is provided with the QLR Manager installation to allow for quick and easy color selection. Custom colors for table borders, chart margins and backgrounds are predefined to match colors that may be selected for titles, column headers and data cells in reports. The illustration above is the foreground/background selector. The A-B-C in the custom color cells have no significance other than to display the foreground (Font Color) selection against the Background color. As a general rule, if a darker title and column headings are preferred, A can be used for the title, B for the column headings, and C for the data cells or alternate row coloring in the data cells. A company may have specific color preferences that help convey its identity. The color selector allows for the replacement of all custom colors with user defined colors. The modification of custom colors is described in the Control buttons topic below. A custom color is selected by clicking the desired color cell in area 2. The selection will appear in the NEW area of the selector. Clicking the Apply button will apply the selection and close the selector. A custom color can also be selected as a starting point to make modifications using the controls in 4 and 5, or a web-safe color can be selected by clicking a grid color in area 3. This grid along with the adjacent brightness slider control provides for the selection from a palette of 16,777,216 colors. While using a pointing device to select colors, the NEW area will display the color based on the color attribute selected in area 5. In this example, Text Color and Background are the two attributes that can be selected. The control buttons and text inputs located in area 4 allow colors to be mixed, or the RGB hex values entered directly to create the desired colors. The buttons with small arrows adjust in increments of 1 and the larger arrows increment by 8, ranging from hex values 00 through FF. Like a selection from the color grid, adjustments are reflected in the NEW area based on the color attribute selected in area 5. There may be available selections in this area depending on the type of element being colored. The Font Color/Background and the plot color range selector offer these selections. Other types of color selections such as Border Color or Background will not require a selection. If different options exist in area 5, the desired option must be selected before making color adjustments. After making the desired color changes that appear as NEW in area 1 of the color selector, Apply is used to apply the changes and close the selector. The Cancel button will close the selector and discard the current change, leaving the element for which the selector was launched unchanged. The Cancel button also serves as one-step undo. For example, if a custom color was deleted by accident, Cancel can be clicked and the custom color will be restored the next time the color selector is launched. The Remove Custom and Update Custom buttons allow CUSTOM COLORS to be changed for future use. A custom color cell can be selected and the desired changes made by adjusting the color(s) using the controls in area 5. While the custom color cell is still selected, clicking Update Custom will update the cell. Custom colors can also be deleted by clicking the cell to delete, then clicking Remove Custom. If Update Custom is clicked without a cell selected, the NEW custom color(s) will be applied to the first available (white) cell in the custom colors area. These changes will be saved in a cookie on the PC where the changes were made. Clicking cells in the custom area that have neither a foreground (font) color or background color will have no effect. They are empty custom color cells available for use. Related to the creation of custom colors, the Layout panel is very color intensive with selections for all the color elements in reports and charts. 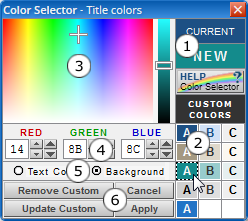 If a user wishes to save all their color preferences, the save control near the bottom of the Layout panel provides a check box for Set as defaults. Selecting this option when a layout is saved will establish all the color selections, along with other layout characteristics, as the defaults for the User ID. The Color Selector for Plot colors functions slightly differently than the others. Three predefined plot color sets are provided with QLR Manager. The defaults for Current is a set of darker colors which work well when gradients are applied to bars in a bar chart. Set 1 is a set of contrasting colors using vivid colors from the web-safe pallet and Set 2 is a set of web-safe pastels. The default colors were carefully selected to provide contrast between adjacent colors. 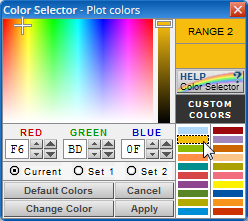 When the selector is launched, the current set of range colors for the Plot colors element is displayed. If the colors have not been previously modified, this will be the default set of darker, or Current colors. The Current set can be modified or one of the other color sets can be selected and applied. All 3 sets are customizable by selecting the range color to change, picking a new color, and clicking the Change Color button. The original QLR Manager default colors for a selected plot color set can also be restored by clicking the Default Colors button. Care should be exercised when using this button. Any changes made to the selected plot color set are saved in a cookie on the User's PC and will be lost when restoring the defaults. QLR Manager provides the ability to save objects such as queries, layouts, macros, and menus. The "Save" or "Manage" control is located near the bottom of each panel. While saving any of these objects, the object may be designated as shared and a description can be applied. The "Manage Layouts" control also provides the ability to "Set as defaults" for the User ID most of the selected layout characteristics when the layout is saved. Objects can be saved simply by entering a Name into the "Save this Query" or "Manage (objects)" control and pressing the Save button. The name of an object can be up to 64 characters in length and spaces within the name are allowed. If the name for the object already exists under the User ID, the User will be asked to confirm replacement of the existing object. The number of objects that can be saved by a User ID is dependent on the edition of QLR Manager being used. The Enterprise Edition also provides "User ID Admin" selections which can regulate save limits by object type for individual User IDs. Objects can be organized by saving them into folders. New folder names can be entered into the folder text input field, or an existing folder name can be selected from the adjacent list. Selecting "(none)" from the folder selection list will remove the folder reference. Folders are presented as option groups in the controls to retrieve saved objects. If a user wishes to allow other users access to the object being saved, the object can be saved with the "Share" checkbox checked. This object will then be displayed under the list of objects available under the Owner's User ID and can be retrieved. In the case of a query, the User retrieving the object must still have the proper authority, such as SELECT authority, to select information from the table(s) in a shared query. Checking this option while saving a layout or form for the logged on User ID will save many of the options as defaults for the ID. This would include settings such as font faces, font sizes, color selections, etc. These become the default values displayed the next time the Layout or Design Form panels are accessed. For saved layout options, the next time a query is executed by the User ID without a specific layout chosen on the Query panel, the default layout values will be applied to the resulting report. The trash icon can be used to discard the saved selections for the User ID and restore the original QLR Manager defaults. In most modern browsers, a detailed description can be added for the object when it is saved by clicking the icon to the right of "Describe:", which will open the description text area. This description can be entered as plain text, or it may contain HTML tagging. HTML entities can also be entered for special characters such as &#8226; for a "•", etc. The contents of the supplied description are displayed by moving the mouse pointer over the icon adjacent to the Current (object) name. These same info icons can optionally be used for queries and macros that are items in a user menu. The "Manage (objects)" control provides the ability to reset the panel to its default state. On the Layout panel, a reset will restore all the values to "Based on Query". Using Reset on other panels will remove all field entries and restore the original defaults. The "Insert before" feature allows a row of data to be added, or on the Layout panel, a new report column. After choosing a row or column reference to insert a new one before, QLR Manager will automatically insert the new row or column. Just as the Insert allows the User to add a data row or report column, the "Remove" feature will remove a row or column. The User will be prompted to confirm the removal of the data row before the removal will occur.